First Pressing (1989): Packaged in white cover, limited to 666 copies. Came with lyric sheet and black inner sleeve, some copies with two promo postcards. Second Pressing (199? ): Packaged in yellow cover with lyric sheet. Third Pressing (1994): Packaged in red cover with lyric sheet, limited to 400 copies. Japanese Pressing (1990): Packaged in yellow cover with lyric sheet. Released by Supernatural Organization (SUR LP 8). This is the only pressing to list "In Sacrilege" (Track B3) in the tracklisting. Enrico Chiarparin Art Reissue (2000): Packaged in heavyweight plastic sleeve with 12"x12" info sheet, this picture disc reissue features artwork on both sides by Enrico Chiarparin. Limited to 2000 copies. The 1st, 2nd and 3rd pressings are etched "For, and about and forever." and "Time to stop, time to think, time to change, heilige leben." This one is listed as unofficial. The Live in Japan DIJ release on same label apparently had contracts signed authorizing it's release even though Doug didn't like the final product. Was it the same situation here where contracts were signed and then Doug didn't like it? How is this one different than the Live in Japan LP? I wish I liked this album. I feel like I'm missing something. I like a lot of DIJ's later stuff (But What Ends and All Pigs Must Die are among my favorite records) but this album really doesn't do anything for me. "Tedious" would be my go-to word for it but that almost gives it too much credit. Heilige Leben is beautiful, though, and more importantly: Fall Apart almost redeems the whole album. Fall Apart is one of the best DIJ tracks I've heard. Wish I could say the same about the rest. Have had this pressing for about a year now and it is superb! Fantastic artwork, presentation and sound quality. Fitting for a masterwork such as this album. 10/10. only 400 copies in red. Some of the reissues having the whiphand on cover and cd label. A true masterpiece and for me one of the greatest albums ever! The first song, with it's hypnotic droning noise and massive length drags the listener deep into the albums atmosphere and from there on everything is pure brilliance. Giddy Giddy Carousel, the second track, is one of the best folk songs Douglas has ever released, but also adds a more industrialish element with the heavy militant drumming through the song. Heilige Leben adds more hypnotic industrial followed by the best song from DIJ, Fall Apart. The song is just.... words can't really describe! Very emotional, minimalist but still powerful and emotional. The two songs that follow bring along vocals from Boyd Rice, David Tibet and Rose McDowal providing more diversity to the album, and after that everything ends with spiralling, desperate wall of droning ambient noise. This is how a great album should be composed. There is not a single extra track on the album, but still it does not end too soon and stays diverse all through to the end. Wall Of Sacrifice is my first Neofolk/Industrial Folk/whatever album and it has not lost potency with time, quite the opposite! Even though material here, considering the history of the band, is very personal for Douglas, it's easy to find your own meanings for the songs and grow with the album all through your life. Sorry to go so hyperlative while describing this album, but there is just no other way to explain the marvelous brilliance contained within. I personally consider this as a must-have for any album collection, even though the material here will propably be too much for casual listener. My own rugged and damaged copy of this album has been through a lot with me, and will propably soon be unplayable due to wear and tear, but still, crowned with Douglas's autograph, it will always stay as one my most treasured items! Some notices about the red version. The red sleeves to “The Wall Of Sacrifice” LP had come about by mistake in 1989 due to an error at the printing company. Rough Trade informed Douglas P. Of the error who said these covers were totally unacceptable and so Rough Trade “filed them away” to be forgotten about for 5 years or so. Discovered in 1994 and handed over to World Serpent Distribution, these red sleeves, with Douglas P.’s permission, were combined with leftover sleeveless copies of the original vinyl pressing and sold off. No more than 400 copies of “Wall Of Sacrifice” in red sleeve exist and come without the original black heavy inner sleeve. In my opinion this mistaken red version remain the most fascinating. This is Death In June's immortal masterpiece. 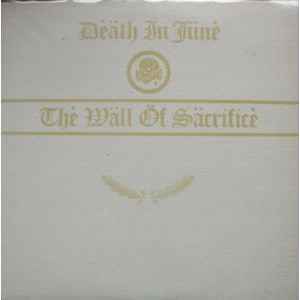 If Douglas P. had done as announced, ending Death In June with this last record and then killing himself, he would have entered legend much more then he actually has. It would have been a pity just because we would have never listened to "But, What Ends When The Symbols Shatter?". "The Wall Of Sacrifice" closes an era for DI6, it's a definitive album in all senses, truly apocalyptic, truly disturbing and desperate. It's divided between industrial/experimental tracks (the title-track, "Heilige Leben", "Bring In The Night", "Death Is A Drummer"), and acoustic folk ballads, which are the best Death In June songs of all times ("Fall Apart", "Hullo Angel", "Giddy Giddy Carousel", "In Sacrilege"). A pity that for many years it has remained the less known of their albums, due to the very limited press of the LP. Now that it has been reprinted on CD and distributed by Tesco Organisation, this milestone is finally accessible to everyone.